The ocean view is too close for comfort at a Pacifica apartment building. Residents evacuated from a cliffside Pacifica apartments last week saw the impending disaster almost two years ago. Owners of the buildings on Esplanade Drive say they had applied for a permit to build a barrier at the base of the decaying bluff as early as 2007. But a neighboring building owner's complaint prevented the wall from being built until last Thursday. Comments on the Fix Pacifica blog also place blame on Pacifica's city engineer, Van Ocampo, suggesting he had held up the work by asking for the apartment owners to also fix nearby city-owned stairs and contribute $60,000 to build a coastal trail. Despite the delays, some residents told the San Francisco Chronicle the erosion still took place sooner than they anticipated. 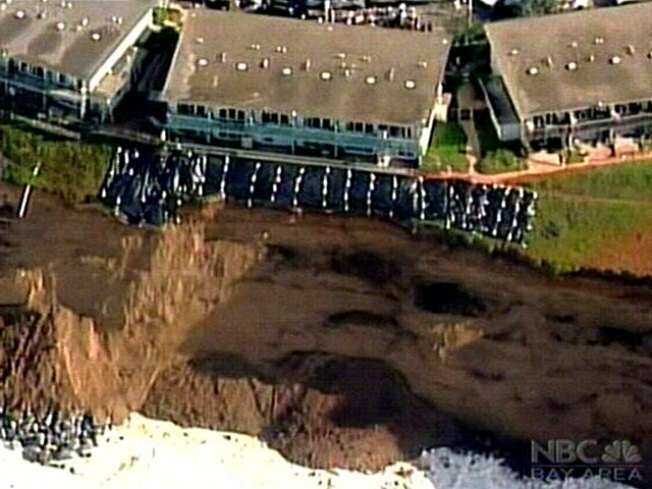 Residents were ordered to leave their seaside apartments in Pacifica Thursday after it was discovered a bluff below their homes was collapsing. The dangerous situation became urgent within the past few days, as the ocean tide washed away the cliff. Now the building at 330 Esplanade in Pacifica is just a few feet away from becoming history. The city ordered everyone out Thursday after the bluff outside their decks shrank. One woman said there was about 25 feet between her patio and the cliff just the other day, now it's down to three or four feet. The permit had been delayed when a property management company from a neighboring building said the wall could not be built along its property line, which was required to get the wall in place. But Thursday, the emergency permit was issued and a day later a crane was brought in to build a more-than-2,000-ton rock barrier at the base of the bluff to save the housing.